We all recognise those beautifully bleepy 8-bit sounds of yesterday, but do you know how to create them? Fear not, because SampleRadar is on-hand to provide a wide selection of lo-fi noises that are ready to be dropped into your productions. Based on simple synth sources, these have been squashed and processed to give you that authentic chiptune vibe. The 8-bit bonanza samples are divided into four folders: Bitty Noises, FM Arp Loops, VocoBit Hits and VocoBit Noises. 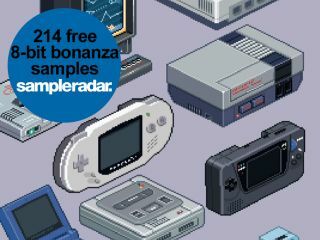 The 8-bit bonanza samples are supplied in a zip file, so you'll need to extract them before you can see them. Enjoy!